Garden Koi Pond Guide - Enjoy the beauty of your own garden koi pond. and be the envy of your neighbourhood! Have You Wanted Your Own Koi Pond, But Just Don't Know Where to Start? Do you want to add some spice to your yard? Are you interested in an outdoor Koi pond but have no idea on how to get started? If this sounds like you, you are not alone. But luckily, we have put together a great guide which will supply you with all of the information that you need in order to get off on the right foot. This guide has helped hundreds of home owners turn their average run of the mill yard into a natural haven. You will be well on your way to being the envy of your neighborhood; and who among us would not like to have that title attached to their name! Join the growing number of people who are finding Koi fishponds to be a great investment, not only because of their enthusiasm for the Koi fish, but for the pond itself - the sense of escape, of peace, and of harmony that a good Koi pond can bring. Plus, Order Today and Get 2 Bonuses Absolutely FREE! 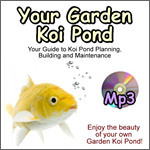 'Your Garden Koi Pond' book in mp3 audio format! Now you can download the audiobook version and listen to it on your computer, ipod, or even burn it to cd. 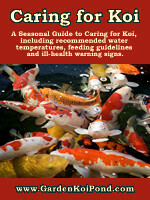 'Caring for Koi' - A Seasonal Guide to Caring for koi, including recommended water temperatures, feeding guidelines and ill-health warning signs. Order 'Your Garden Koi Pond' and download both the Adobe PDF Ebook version AND BONUS Mp3 audiobook version of it aswell! Click the Order Now button and you will be downloading this koi pond pdf guide and bonuses in just a few seconds from now! 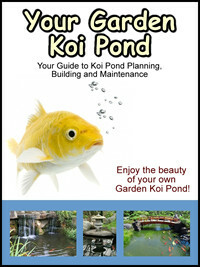 P.S Remember, this koi pond pdf guide (and mp3 audiobook) covers everything about building your own garden koi pond. From planning and construction guidelines to choosing and caring for your koi and maintaining their water quality, it's all in Your Garden Koi Pond! P.P.S. You have a full 60 days to get 100% of your money back if you are dissatisfied in any way!